Sewing vocabulary - everyone has an opinion! That was fun to read the responses to my last post, Random Threads # 10, where I tossed off a paragraph on the words we use to talk about our sewing. The "make" debate has strong views on all sides and I enjoy a good lexicography brawl. I will stick to using the terms sewing projects, or finished garments but I think make is making inroads, ha ha. 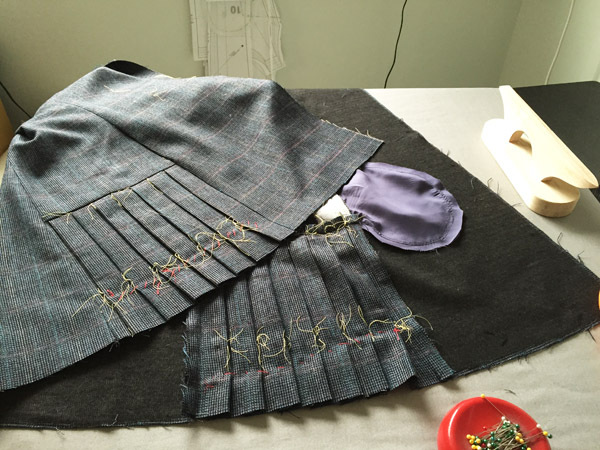 For you coat enthusiasts, here is a sneak peek at the Quart coat I am currently sewing using a wool plaid. The pattern is from Pauline Alice patterns, and I seriously love the pleats. I did have a few grumbles when laying out the pattern, I mean plaid - what was I thinking? but it is seriously gorgeous and will look great. And you know I love plaid, so it's worth the trouble. More details in a post when it is finished but for now a look at where it stands. All pleated and the main pieces sewn together. Clapper nearby as you can see, wool + pleats = need for some type of wood block when pressing. Yes, I marked the pieces with tailor's tacks to do the pleats. I enjoy doing them.! A little tedious but something like a nice math puzzle, pattern markings all even and measured perfectly, so it pleated up very well. The yellow thread is the tailor's tacks, and now the pleats are basted closed with the red thread. They will stay basted closed until I am ready to press again and hem. I had a new post on the Craftsy sewing blog on Sunday, which is all about cutting out fabric when you don't have the right amount. Something we are all familiar with, right? As it happens when I was writing that post, I was sewing up a Sewaholic Renfrew top in luscious silk jersey and didn't have the required amount of yardage so it illustrated the issue perfectly. I think the pattern calls for 2.25 yards of 60" to make the Cowl neck version, and I had about 1.75 yards. I was making this for a sewing client (she of the very good taste in fabric, see here and here) and she wanted it to be longer, more like a tunic plus with long sleeves. So I played around with the layout and some careful cutting, and was lucky enough to get it out of the yardage, although it is not yet hemmed as you can see. Silk jersey feels so great to wear, I will admit not the easiest to sew, but the colors are fantastic. So that's what is going around here. Rumor of rain today which did not appear - a few daffodils getting ready to bloom but otherwise the season is feeling very strange. We are turning into SoCal around here. But with fog. and a SunnyGal garden photo. This big shrub sits next to the garden gate and I never really notice it all year except for maybe two weeks, when the tiny flowers bloom and it gives off the most heavenly fragrance. 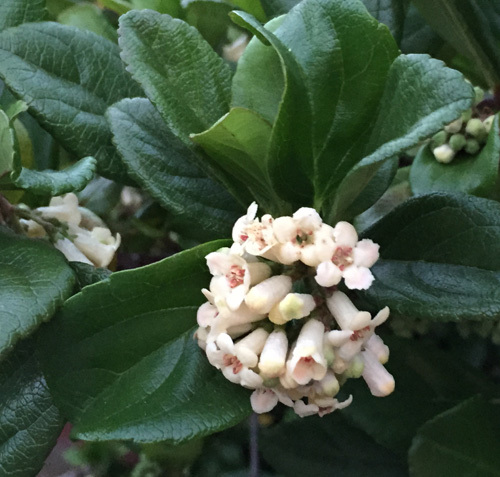 I had to search on line and compare lots of shrubbery to decide that it is Viburnum. I think? You gardeners will let me know. The little flowers turn into tiny yellow berries and it gets a little garden love from me this week as it is about the only thing blooming. My last Random Threads post was in October, whew! So my notebook page has quite a few entries. I jot down things that come to mind because they are likely to be forgotten in no time. I think the Pattern Whisperer took up some of my focus in the fall, has anyone made anything based on reading those recommendations? I would love to hear it. I am trying to get another one of those posts before winter starts to subside, on coats but I have a few ideas bubbling around regarding maxi-dresses. Which sounds way more appealing to me - like something you can wear lounging around with a tropical drink. That is my type of fashion! 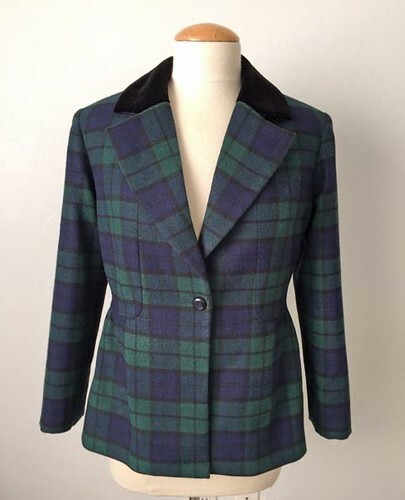 Speaking of coats, here is something that is going to get my attention for the next week or so. I love this pattern, the style has interesting and unique details. 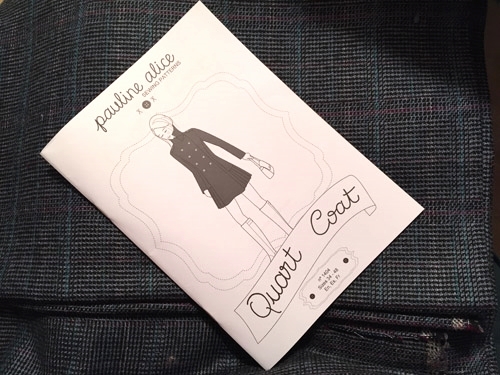 Pauline Alice is making some very nice patterns and including some designs that are beyond the basics, in a good way. This will be for a friend of mine as I am still planning on making the Burda coat for myself. I have to! that muslin looks so good so I better hurry up. Maybe I will have both these coats going at once. Ok, let me just say it. The latest Vogue release was a great big letdown to me. Not one pattern that I wanted. I think at this point I see the style lines and drawings and know I have virtually the same pattern or close enough already, that goes for most of the staple items. No interesting dresses from Donna Karan, while I generally love her stuff the last two releases didn't interest me. 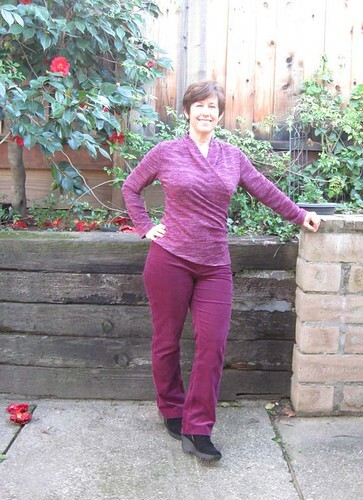 Including the Donna K jacket/pants pattern which seems popular, that waterfall front doesn't appeal to me, just too much fabric, I feel like I am swimming in those type of styles. A lot of people really are making positive comments about this collection, and I think that is a very good thing! If everything Vogue release appealed to me then that would mean there were a whole lot of people who don't - as they say constantly on Project Runway - "have my aesthetic". So that it appeals to a broad range of sewers is good for sewing and pattern makers. And I have plenty of not yet sewn patterns to console myself with :) Although that Sandra Betzina dress - it looks bad even on the model. 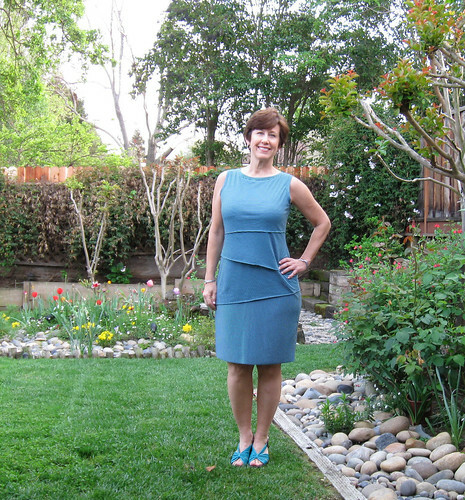 And after the success of that other interesting dress, the "shingle" dress Vogue 8904. Her patterns to me are either quite good or totally wacky. And now I mentioned Project Runway. Is anyone else still watching? I will never not watch a show that features sewing. But it is not very good, and if they would give them more than one day I think the result would be much better, they would have time to think a bit instead of frantically making drapey and cut-out looks. Do you ever see any civilians wearing dresses with the back cut out? I don't think so. Yet they all do it time and time again. So tedious. Labels in clothes - I see that some pattern designers sell labels which can be cute but I am so anti-label. They just drive me crazy and if I buy anything - which yes, I do buy plenty of stuff - I immediately get out my tiny scissors and painstakingly extract that label. The ones in the center back of a neckline are the worst offenders. Silk blouses, cashmere sweaters, these are delicate operations but I do it or I can't wear the thing. And how about labels that show through because the item is light colored or sheer. Labels should be banned. I think the undies/t-shirts with the screen print labeling is such a great innovation. Here's something that has been bouncing around in my head for a long time. Do you call your sewing projects "makes" ? I know it's becoming common usage and if you use this term it's certainly fine, that is how language evolves, but I sounds very odd to me. Recently I saw this post on Ann of Gorgeous Fabric's blog, and saw that there are some strong opinions on this one. One person even mentioned something that also occurred to me when I was watching the British Baking Show on PBS, on that show they refer to their "bakes" so maybe this verb usage is starting in the UK and will catch on everywhere? A lot of other comments there had to do with "sewer" and "me-mades" which are two other words that I haven't started to use either. But whatever words you choose, as long as you can write about sewing and patterns I will probably read your blog or pattern reviews. Lastly, I have made a few Lekala patterns and a few patterns from a newish but similar company, Bootstrap Fashion and have seen a lot of comments with questions on the sameness or differences between these two pattern lines. Lekala has been around a while- not sure how long. They were first available via their Russian website but upgraded their web presence a few years ago and have a very easy to use site, you can pay via paypal and they are super quick. Offering custom sized pdf patterns with slightly awkward sewing instructions. You input your measurements for a custom fit. Everything I have made with their patterns has been good, I found the fit to be very close. 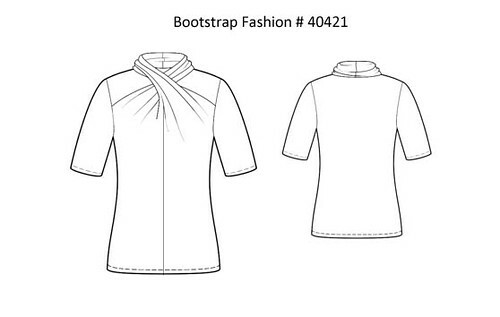 Bootstrap Fashion is another company offering a similar service, an array of patterns, you input your measurements and get a custom pdf pattern. Also slightly minimal instructions. When I was contacted by Bootstrap to try a pattern, they told me they purchased the same software package as Lekala uses, thus the similarities or exact same styles. They do use slightly different measurement adjustments - Bootstrap has a tummy adjustment that I think is very useful. Pricing is slight different but in the same ballpark. I know some people have had very weird results using these patterns but if you are having trouble with fit it might be a place to start. Having said that I am working on some posts for Craftsy on fitting adjustment examples. Never can get enough info on fitting, right? And I learn something new every time I try a little experimentation so it is rewarding for me also. 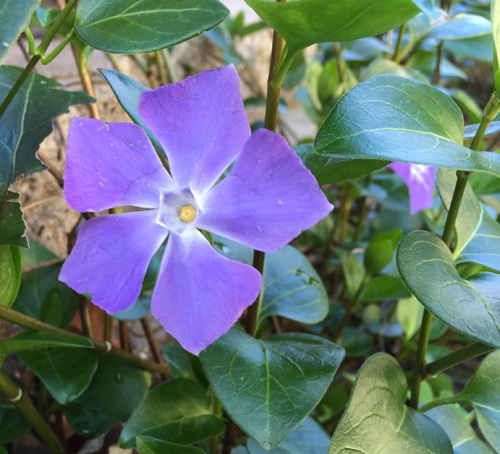 and because this might have been a post lacking in pictures, I will include this bloom which is on a Vinca? I think. There is tons of this growing along a public walking path and some of this may or may not have come home with me continuously for a period of many weeks last winter. It survived and multiplied over the year and now filled up the dull retaining wall with lots of greenery and nice purple flowers. 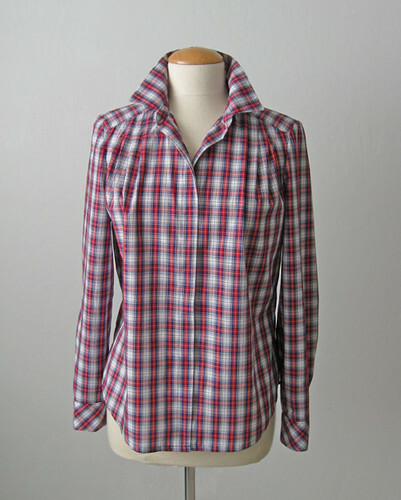 January is here, thus I must make a plaid shirt. Well not really but I made one last January, seen here, but that one was flannel and this one is not. Ok, let's get it out of the way - I found this fabric at a garage sale. Yep, last summer just stopped by one where I saw a sign, saw the bins of fabric and rummage through some awful stuff to came up with a vintage-y plaid cotton, super soft and perfect for a shirt. So maybe 4 yards for a couple of bucks? Sold. But I am getting ahead of the actual news in this post. I used a new pattern! A new to me at least. Not sure when this was released but it is a Burda Envelope pattern 6840 with two views, a collared shirt or a bow blouse. I love a pattern with multiple views! I would say this pattern has features of what I consider a blouse or a shirt. What is the difference? In my mind a shirt is a style that can be worn by a man or woman but a blouse is female only. Sound right? I am sure there is some technical definition. 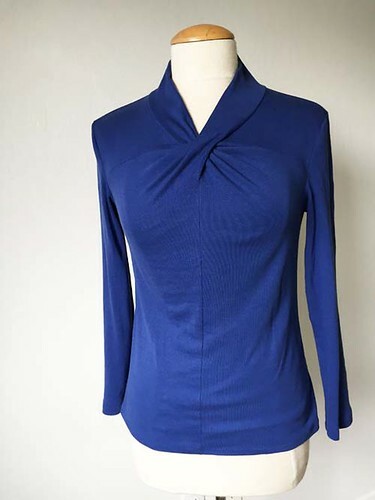 But as you can see this blouse has no darts but instead pleats at the shoulder yoke. Which made it perfect for a plaid as it could match at the side seams with no horizontal dart to consider. The sleeves matched up well, or at least I fiddled around with the layout/cutting until I decided they would match. 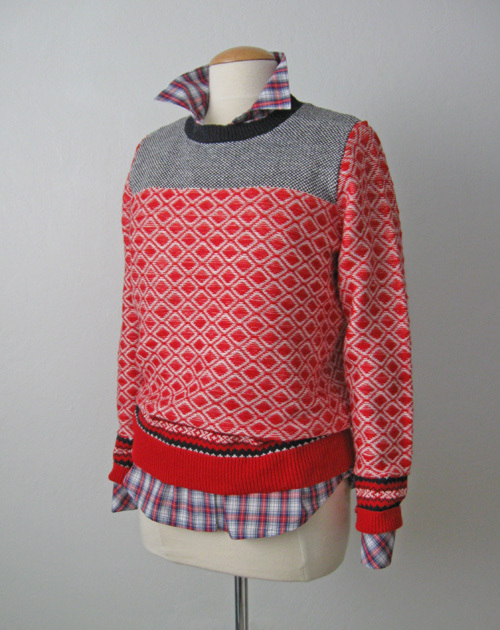 I like a plaid to match across the body and continue to the sleeves. 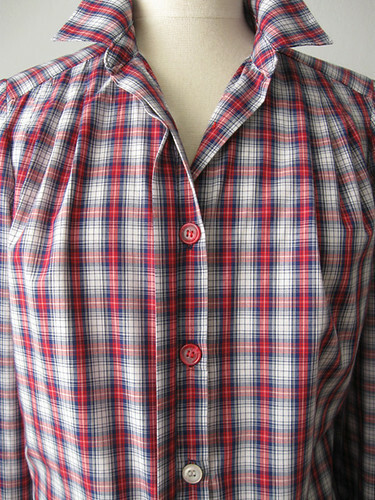 Also a hidden button placket. 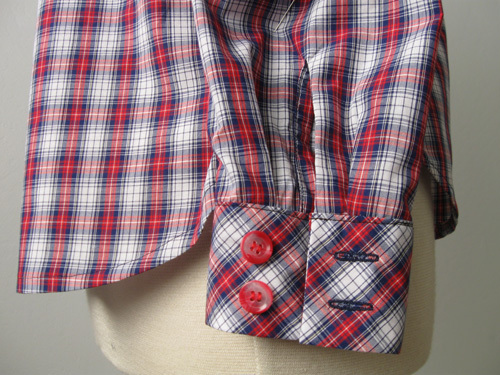 Hidden Button Placket !!! I love this design element and SO few patterns have this. It is such a pain to add it but this one is beautiful! And now I will show you my hidden button secret. I only had 7 of these perfect little red buttons in my button box. No idea where they came from but I liked the way they matched so I have used a few white buttons on the lower part of the shirt front - they will never be seen except now I just showed you. Not bad with that plaid, huh? It is such a pleasure to work with a well behaved cotton. Makes me realize that some of the c*** they sell at the chain fabric stores is so not worth the bother. As for this pattern, I have two tiny criticisms of the design elements. First, there are 4 pleats on the shirt front. Somehow I thought it was just a little bit too full there, for me 3 pleats would have been fine. However if you have a full chest this pattern might just be a nice choice, plenty of room in the bust. Second little criticism, I think the collar stand is a tiny bit skimpy in height. it is maybe 1/8-1/4" shorter than the collar stand on my other shirt pattern - the Simplicity one. I think were I to make this again I might make that a bit taller. But that is just personal preference. 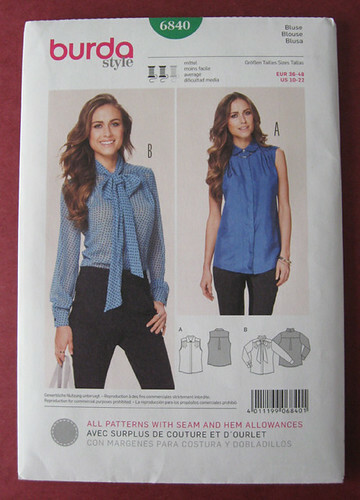 Here is a look at the pattern envelope, Burda 6840. When I bought it I thought the bow blouse was very pretty but on further reflection the bow would probably drive me crazy so I don't see that in my future. But it is pretty! Burda question - is it just me or is Burda very skimpy on the pattern markings? I am accustomed to Vogue patterns which have way more notches and markings. For example, sleeves with front/back notches. dots etc. While I might not use them or even believe them, I like them to be there. Slight nitpick which I realize makes no sense, but there it is. And it fits quite well. A perfect shirt to wear with jeans. The sleeves are a bit long, I did not shorten them and I knew they would be long, but I like shirt sleeves to have length, sometimes I wear with a sweater and the cuffs pulled out, or rolled up so the extra length is good. The actual length of the shirt was quite long so I shortened by about 2 inches. There is an inverted pleat in the center back which is a feature I always like. I have my hand in my pocket which is making the lower portion tight around the hip but it falls straight. There is no shaping in the back but that is the design which is how a shirt with a center back pleat should fit. What else? Cuffs - you can see I used up 4 of my precious little red buttons on the cuffs. I like a 2 button cuff so that only left 3 for the shirt front. When doing the sleeves I started to make a placket but after a few minutes thought why bother, and so did the easy shirt cuff finish. What is that called? It is just a slice in the bottom of the sleeve and a strip sewn and folded over? Anyway it works well on this type of fabric. I did make it a bit longer than as shown on the pattern which makes it easier to roll up the sleeves. Cuffs are always too big around for my dainty wrists (ha) but I leave them as is and just move the buttons over. Cut them on the bias just for fun, I like the look. Here is why I was motivated to make this shirt now. I received this sweater for a Christmas gift and I love it. Perfect match for the shirt fabric. I have worn this outfit twice now already which is a sewing success, hot off the sewing machine and right onto me! So a new pattern for January, and I have purchased a couple of others recently. They had Burda envelope patterns on sale at Joann's for $ 2.49 which is a steal and I just saw them again on sale this month. Maybe a new trend? I am waiting for the Vogues to go on sale as I have decided on a couple of those also. The much needed rain made an appearance in December and we all breathed a sigh of relief. As it turns out that was premature - it has been a totally dry January with nothing in sight. I think this year's new plantings will be succulents which do well in our now very dry California. 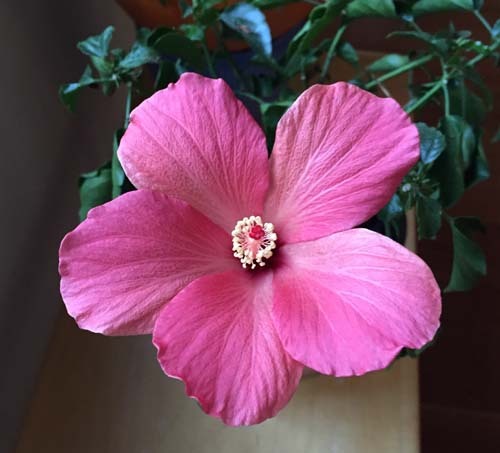 For today's garden photo, a pink Hibiscus which I had outside up until a week ago when it seemed too cold. So living indoors now and putting out a gorgeous bloom every so often. To my surprise there are a lot of you interested in Home Dec sewing. Which maybe shouldn't be a surprise. After all if we have a typical wardrobe we don't wear the same clothes every day, but those sofa pillows, duvet covers and curtains are right there in front of us, day in and day out. So even if they are not well liked they are still right there in front of our noses. Better to buy some fabric you really like and sew up something that makes you happy. 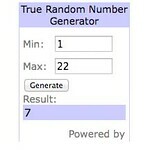 So the drawing result out of 22 who were interested is # 7 which is Stella, so please email me and let me know where to send. Now back to sewing clothing. Each winter I make a knit top for a friend of mine who wears the same size as me (does that could as only slightly unselfish sewing?). 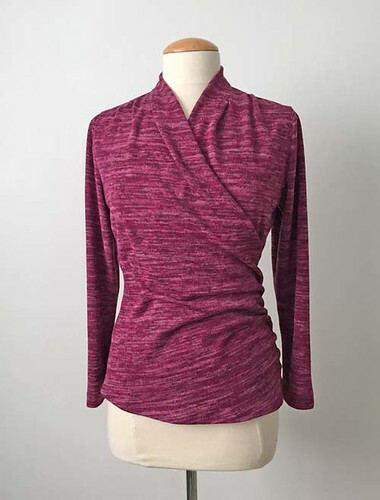 I have had my eye on this twisty knit top for a while, I believe I saw it on Pattern Review some time in the past year done in stripes and it looked really great. But not stripes this time, I decided to give it a try in a cotton interlock knit I had to test it out. Here is the pattern drawing, which is a Bootstrap Fashion pattern, where you input your measurements and they send you a customized PDF. So far I have had really good luck with these patterns, the fit has been very nice for me. Granted I am kind of a averaged sized in most areas so not the most difficult person to fit. edit on 1/15/15: based on the comments below, some are curious about Bootstrap Fashion patterns and the similarities to Lekala. 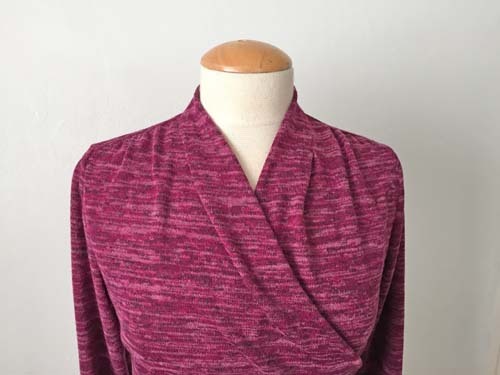 I wrote a post in November with my first pattern from this company, so if you are interested in more details and want to see what measurements adjustments are available check out this post. Here is the test version for me in cotton interlock. Very cosy and it actually looks better in the picture than in real life. The fabric is not all that great, but fine for testing and resulting in a warm top to wear around the house. Here is the second one for my friend Michelle. Fabric is rayon jersey. I am sold on this pattern so you will be seeing it in the spring made from a cotton jersey stripe. Sleeveless most likely, with the front on the bias so the stripes will give a chevron effect. Maybe I should revisit my stripes on the bias skirt. Or too stripey? time will tell. So a new pattern and a repeat so far in 2015. 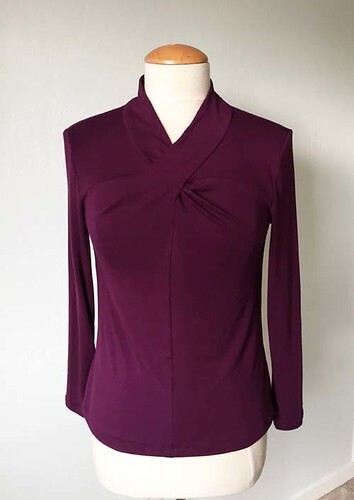 Next up is another new to me pattern, a Burda shirt which I wasn't sure about in the middle of sewing but have already worn twice. Are you starting the new year as I am with some closet cleaning? Even though in my mind the new year starts in September, must be that back to school mentality but I feel like end of summer turns the page and a new year starts then. In any case, I took a look at my closets and have been tossing out some useless junk. Like why do I keep old sneakers, which are lined up on a shelf in the garage? Completely worn out and how many pairs do I need for muddy gardening? not more than one, so out! Plastic containers in the kitchen cupboard with no matching lid, out! Dutifully put in the recycle bin where applicable but otherwise a nice feeling to clear away the junk. On a different note, January is a good time to do some sewing for your interior. I have a vague plan to make a new duvet cover but that remains to be seen. I enjoy home dec sewing for the most part, lots of clean angles and no tricky fitting, with the fun bonus of math calculation thrown in for good measure. I have a new post today on the Craftsy blog on sewing throw pillows. Which may seem fairly simple but have you ever sewn a pillow cover and the corners are a bit too pointy instead of plump? Somehow your pillow retains a weird dog-eared shape? 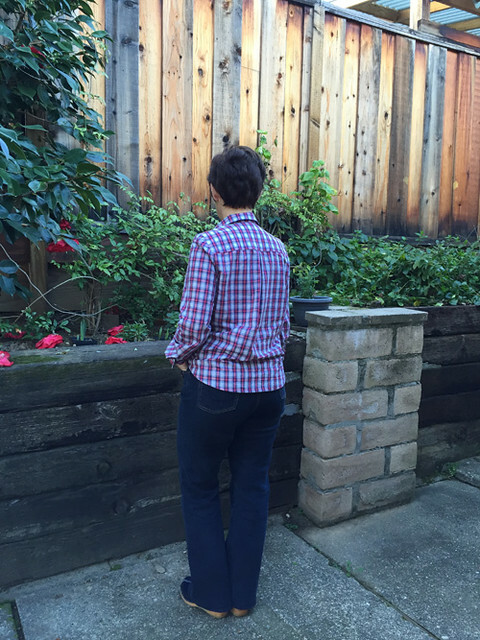 Check out my post for a solution. 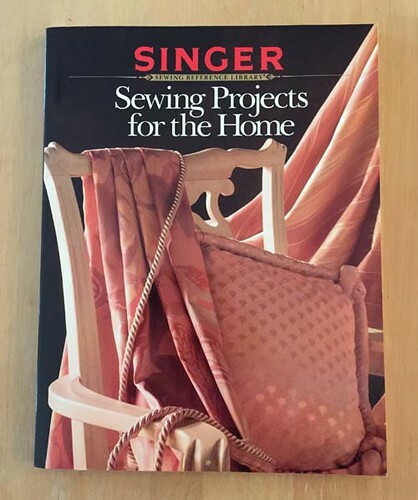 In the spirit of decluttering I am offering a giveaway of this Singer Sewing for the Home book seen below, which I found at a garage sale (of course). I have said it before but these Singer sewing books are fantastic, the photos are really good and illustrate their information well. If you find the Singer Tailoring book do not think twice - grab it and pay whatever they are asking (well, if it is under $ 10, I suppose) because that book is golden. I don't think of myself as much of a home dec sewer, and then got to thinking this morning about what I have sewn over the years. Curtains, cushions for a kitchen banquette, throw pillows, duvet covers and pillow shams, window valances, lots of outdoor chair covers, tablecloths and napkins. OK, I guess periodically I do indulge in a bit of home decor sewing. I think of it as utilitarian but it is quite rewarding to get just the color/fabric that you want. Anyway, if you are interested in this book let me know in the comments and I will randomly choose one name to send it to. (International is ok). 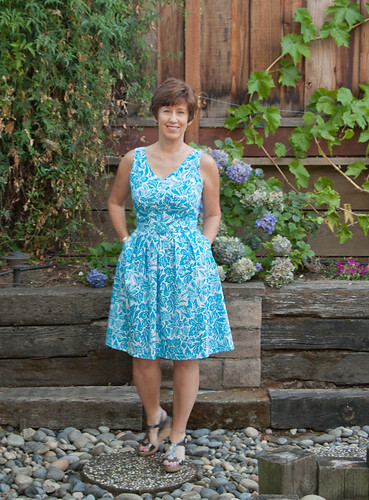 So much for expanding my repertoire - the first item I have sewn in 2015 is another version of New Look 6150. 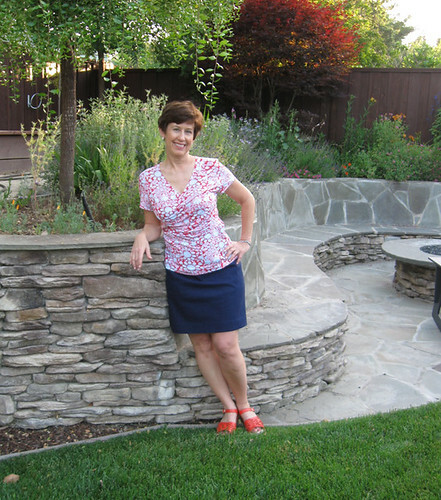 Which is a fantastic top and the two versions of this pattern that I have sewn for myself are in constant rotation once the temperatures turn chilly. But I really wanted a more sweater-ish version, similar to one I made for a friend. So in September I found this great sweater jersey at Stone Mountain and snapped it up. I think I bought 2 yards but now that I have sewed this one there is a good 3/4 plus remaining. So I predict a raglan tee also. Not too much to say about construction, although I did narrow it in the shoulders about 1/2 inch as the other versions seem a bit droopy in that area. So I just cut off the 1/2" at the outside shoulder tapering down to zero about 3 inches down. The color looks different in every photo, perhaps the one below is more accurate although a bit overexposed. I am not the best hemmer when it comes to knits, sometimes I get a good result and sometimes it looks a bit wobbly. For this one I didn't put my usual interfacing, just serged the edge, turned and zig-zag. 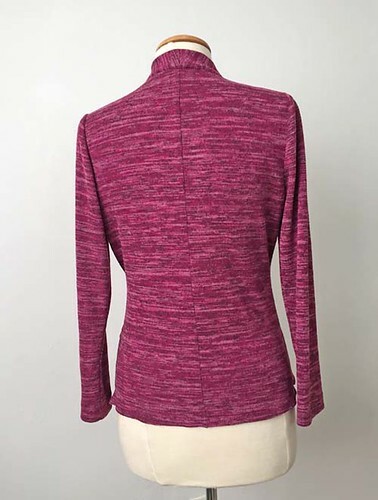 The stitching disappears into this sweater knit so it doesn't really show. Here is the pattern envelope. 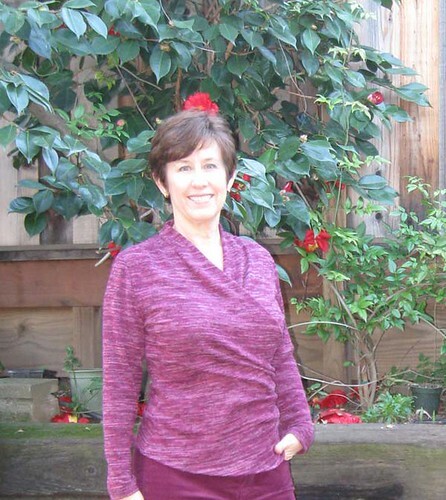 This one was listed on Pattern Review's Best patterns of 2013 and I think it is very flattering on a lot of people, the V-neck is not too low so it doesn't gape and the plain t-shirt is a good basic. I just saw their page with the choices to be voted on this year, 21 patterns to vote on to select the 10 best, and I thought it was a snooze fest. To me not really an interesting one in the bunch. I am kind of cuckoo for these crossover knit tops, aren't I? and yet I don't have a wrap dress in my wardrobe. Maybe this year. As for the color, it seems I have created an outfit in the Pantone color of the year, Marsala. Well maybe not quite but kind of close. I just ordered those corduroy jeans right before the holiday and when they arrived I saw they were a perfect match for this fabric. So that was a win. A few bursts of shopping in December - holiday gift shopping for family is fraught with danger - I often succumb to the "one for them and one for me" mentality. I bought those shoes I am wearing above, one day at Nordstrom totally on an impulse, and yet they have become favorites very quickly. They are super comfy, great on rainy pavements and very warm! They feel like I am wear apres-ski boots but without suffering through a day of serious mogul skiing on our typically icy and unforgiving Sierra snow. However I did make a quick trip to Philadelphia in December (where I almost froze my *** off, despite wearing my trusty shearling coat that is perfect for winter travel, it doubles as a pillow/blanket on the airplane) How do you frozen tundra people do it? OK, I am a weather wimp but wow, I just can't deal with cold. 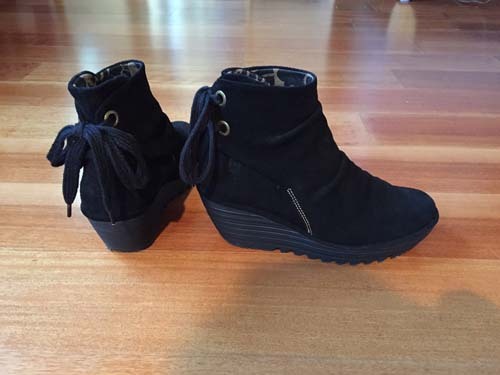 I did realize that these shoes with the lace up in the back are not the most convenient things for taking on and off thru the airport inspection lines, ha ha, but otherwise were great. (the brand is Fly London). I have a couple of other knit tops which I finished before the year's end and just started on a shirt using a new pattern. The jury is still out on this one but I really like the fabric so I think it will be OK.
And yes, I am just about ready to start on that Burda coat - gotta get a move on that one or the winter will be over here before we know it - which will be fine with me! Here is today's garden photo, a very pale pink camellia which has lots of flowers but they do fade and drop very quickly. 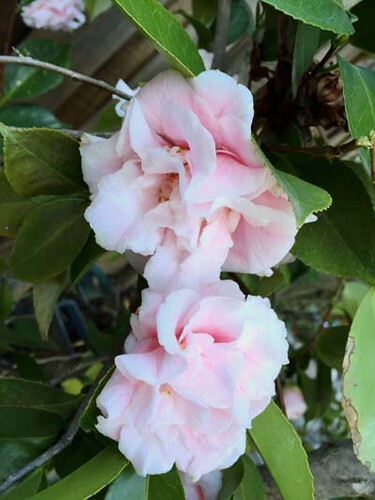 Camellias are so pretty but but their bloom is so quick, good thing the shrubbery is nice and green year round. It certainly is that time of year, to take stock, look back and plan for the future. A little spreadsheet analysis can be fun when put to an entertaining use such as this instead of boring business stuff. So as I did last year, here is a look at what I was up to this year. Surprisingly to me, more items than last year even though that was not my impression before doing the tally. 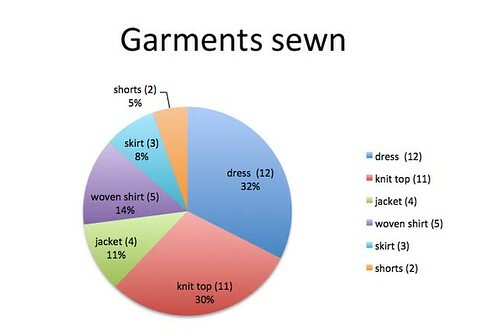 Before I get to those numbers, a few thoughts on other sewing related categories. 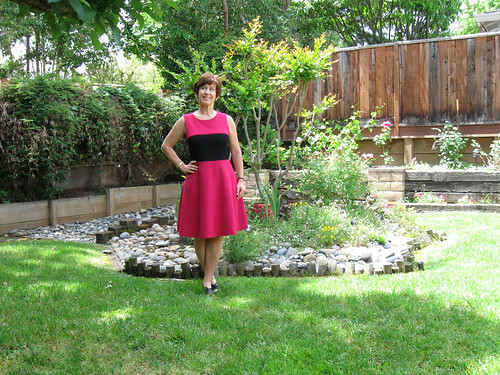 This year has been a great one in and out of the sewing room and here's why. First and foremost I had the pleasure of meeting so many great women this year who decided to have sewing lessons with me. I can't express how much fun it is to spend time with people who are as passionate as I am about sewing and improving their skills. I have said it before - sometimes I am a little nervous about meeting someone new - but every time it has been fantastic. If my random sampling of sewing students is any indicator, women who sew are smart, interesting and really nice to be with. 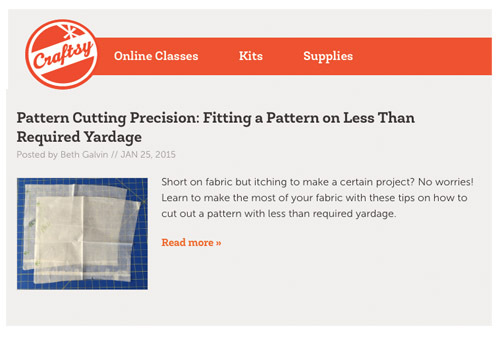 In April I started writing blog posts for the Craftsy sewing blog. I am not much of a tutorial writer so that has pushed me to actually think about what I am making and what to say about it. 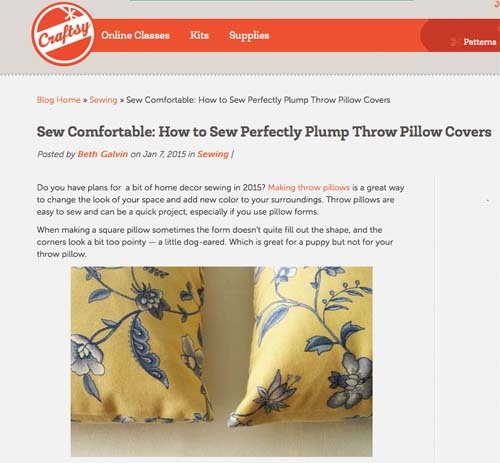 I think Craftsy is such a clever platform for learning, particularly on the niche topics that are where it is hard to find instruction. All my Craftsy posts can be found here. I think this one on how to make a color-block pattern is particularly useful. OK, now for some numbers. I sewed 30 items for myself which tops last years number of 25. In the charts that follow I have included a few items I made for friends and one for a sewing client because I wanted to look at pattern and fabric choice on those items. First up, what I made. Last year jackets took the top spot, and this year it was just about a tie between knit tops and dresses. Which is great as those are the most useful items for me. The climate here permits me to wear dresses a lot and then knit tops go with my jeans and shorts style. A few jackets including a blazer where I did a series of posts on tailoring. Patterns - now things get interesting. The theme of this year was definitely Pattern Repeat. In fact I did a series of posts highlighting pattern repeats. 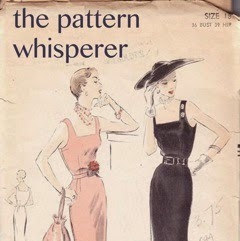 For a while - like 2 to 3 years ago - I was on a pattern buying binge but one day just realized there are no new patterns. I say that all the time and I stick by that. As you can see I did sew the most with Vogue, and then a smattering of other pattern companies including a few independent patterns. I tried a Grainline pattern, mostly to see why they get so much attention and was a bit underwhelmed. I wrote a long piece at the end of post talking about why I rarely buy or sew independent patterns and the response was really thoughtful and interesting. If you have not read that post the comments are really worth a look. As I mentioned in the post - I am really not the target market for a lot of the indy patterns which I think are designed for beginning to intermediate sewers. They are creating a new way to learn to sew, where the instruction comes with the pattern and I applaud the innovation. 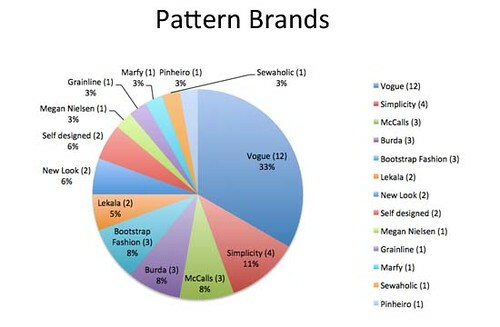 As a follow up to the wealth of comments on the pattern post, I asked the question: what do you pay for patterns? That response was an avalanche! and even more interesting. The prices are all over the map and I can really understand the appeal of downloadable patterns when access to the slightly ridiculous discounts we can get here in the US are not available. 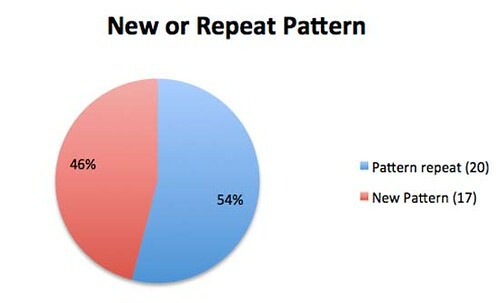 Proof of the Pattern Repeat phenomenon. Look at that, more repeats than new patterns. For me this is quite a change but there are a few patterns that just work really well. 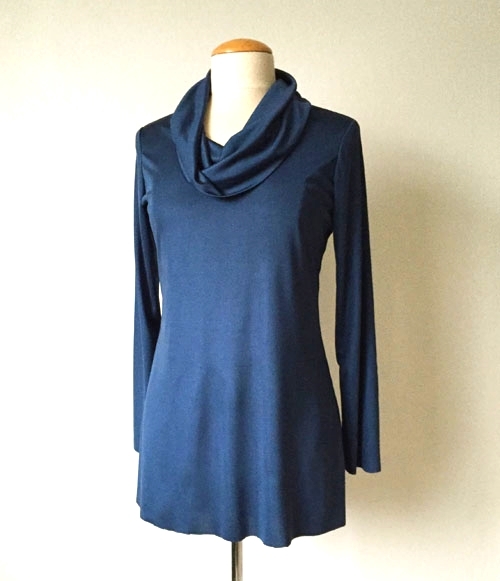 Mostly tops, such as this Simplicity shirt, and the McCalls wrap knit top (worn in the photo at the top of the post). I surprised myself by remaking this Vogue pattern which I kind of criticized when I first sewed it up. I loved this new Vogue pattern but I think it is the color blocking and the fabric that made it really work for me. But my favorite new pattern which will surely get a repeat when spring returns is this Vogue pattern that everyone made and I finally sewed up. 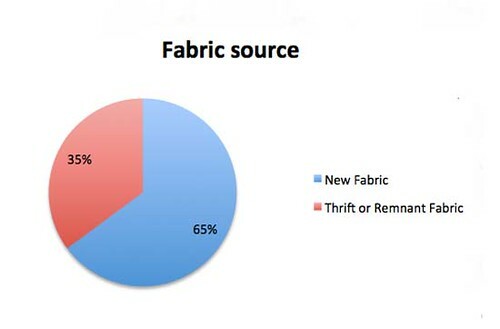 Last bit of analysis is fabric. I made quite a few items with remnants from other projects (the rose and black dress above is one of them). Which means I am careful cutting out to reserve big chunks for another day or just buying too much yardage for any one project. When it comes to buying new fabric I am all about the $ 1 per yard stuff I buy at various garage sales or charity shops. It is getting to be a bit of a joke but a while ago I came to the realization that it is not so much a miserly tendency (which is not necessarily a bad thing) but more the fun of the challenge, to buy some fabric for under $ 5 and see what magic I can do with it. Actually sometimes I can visualize immediately what it will be, so here are a couple of examples. 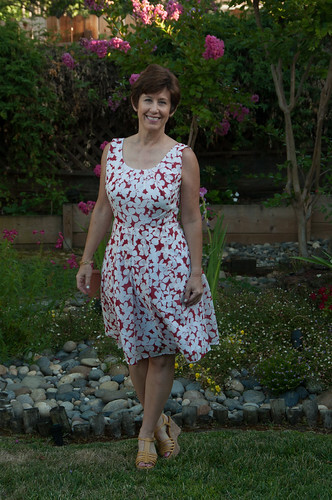 This fabric was just right for a classic fit and flare summer dress and gave me the opportunity to try a custom fit pattern. And my last jacket of the year, just finished in time for the holidays. When I saw this wool flannel on the table my thoughts turned to a jacket right away, with the inkling of a contrast collar. Although my favorite fabric of the year is this cotton voile which I purchased from Gorgeous Fabircs (yeah - new and not necessarily a bargain) This is a case of you get what you pay for and here I got a fabulous gossamer lightweight cotton voile in all my colors. 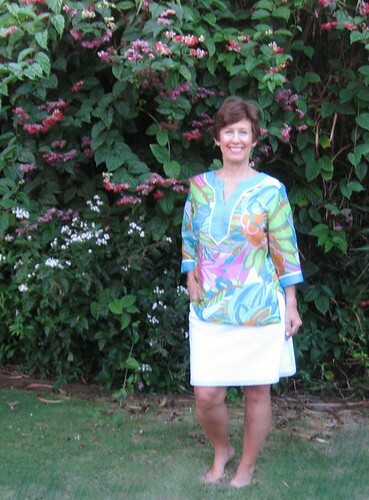 A tunic top which is heavenly to wear and a new silhouette for me, in a self-designed pattern. One more highlight of 2014 has to be the response to my idea of the Pattern Whisperer. Something I had wanted to do for a long time - didn't think much of it but decided to give it a try. 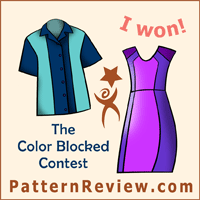 The response was overwhelming and I felt honored that you wanted me to recommend a pattern. Our first "Whisperee" Rachel sewed up a fantastic and super glam special occasion dress so I am counting that as a success. I suggested some work and day dresses so if anyone has sewn up one of those please let me know. 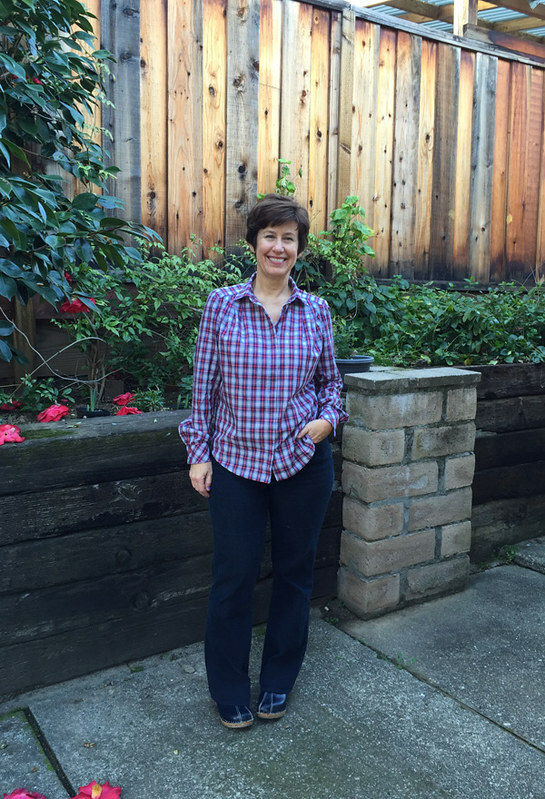 And a thank you to Carolyn for making me the Pattern Whisperer blog button. Hopefully more of you will have the chance to use it as I am working on some Whisperer posts for tops, jackets, coats and maxi dresses. Plus spring is around the corner for us here in the northern hemisphere - my favorite season and more lovely patterns to pick from. Wow, this strikes me as a very good year both in and out of the sewing room. While the garments I have made gave me a lot of enjoyment, the interactions with other stitchers locally and around the world have made 2014 memorable. Here's to an even better 2015! I wish health, happiness and fantastic fabric finds to everyone.